Karachi Islamic studies scholar killed for "blasphemy": Muhammad Shakil Auj killed by gunmen on motorbike. 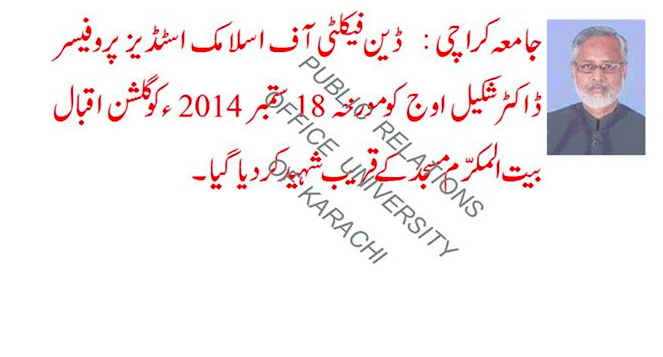 Auj’s image, posted on the University of Karachi’s Facebook page on Thursday, Sept. 18. Unidentified gunmen on a motorbike attacked the vehicle he was riding in on his way to a reception at his honor at the Iranian Consulate. Dr. Auj was shot in the head and neck and died immediately, officials said. A female student in the back of the car was shot in the arm and was treated at a hospital. A week earlier, a visiting religious scholar at the same Islamic studies department, Maulana Masood Baig, was also shot dead by unknown attackers. Auj had told police that four colleagues at the University of Karachi had accused him of blasphemy—including one colleague who’d previously held Auj’s position as dean. The four were arrested but are free on bail, and they are “being questioned” about Auj’s murder, the Times reports. A seminary in Karachi had also called for Auj’s death.